“Don’t kill me, don’t kill me”, the thirteen-year-old pleaded, while over 50 men threw stones. (Account cited from BBC Online). Reports from Amnesty International stated that nurses were sent to check during the stoning whether the victim was still alive. When they picked her up from the ground and announced that she was, the men continued to stone her. Any lawful citizen would agree with me in thinking that this act is a barbarous form of punishment. Yet, Birmingham Tory councillor Gareth Compton called for Yasmin Alibhai-Brown to be killed after she appeared on Radio 5 Live yesterday discussing human rights in China. hurling rocks because someone said something which the Government didn’t like. Many people have argued on forums that Compton’s Tweet was obviously a joke. 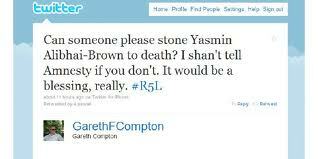 Did Compton’s friends fail to tell him that his jokes on stoning were not amusing? Or did they politely titter? This is not the first time a Tory in the public eye has gained media attention for their casual approach to Capital Punishment. the death penalty in Britain back in 2003. 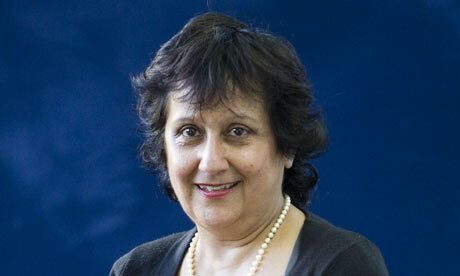 “The death penalty should be brought back for some pre-meditated and cold-blooded murders” (cited from BBC Online). He said that he didn’t think he would see the death penalty during his political career, suggesting it’s not entirely out-of-bounds for the future. I’m sure we’ll be seeing many similar comments now the Tories are in government. 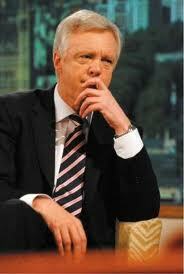 And he wasn’t alone, in a Sun newspaper pole with almost 100,000 votes, 99% opted for the return of the death penalty. Let’s just say, I’m hardly surprised with their use of words such as “monster” and “savages” to describe people. Surely these measures would be counter-productive. People would start accepting that killing is the norm, making it seem far more acceptable. The death penalty does not deter people from committing violent crimes. “The thing that deters is the likelihood of being caught and punished” (Cited from BBC Online). “Research has failed to provide scientific proof that executions have a greater deterrent effect than life imprisonment. “Such proof is unlikely to be forthcoming. The evidence as a whole still gives no positive support to the deterrent hypothesis” (cited from Amnesty International). The problem quite obviously lies in the need to increase the likelihood of detection, arrest and conviction. In my view, the death penalty is not the answer.